Somewhere down the line there started to be a divide between McTwists and 540s. Let it be known that Justin Modica can do McTwists. Pretty psyched on the dudes's Swiss Army Knife-ness and the nosepick grind. I've yet to see the video linked above in its entirety, but I know it's present in the Twin Cities for purchase or you can just go ahead and order Worship Friendship here. The independent video game is a trife game, so drop $15 on a struggling art. Let me climb to a rooftop and bang a drum: Elissa Steamer is one of the raddest ever. As it goes, Chrome Ball also just put up a heavy "countdown to armageddon" post, which highlights the reasons why a certain group of companies should rightfully be regarded as "The Best Ever," especially in light of this abridged bonus feature. I absolutely missed this episode of The Heck Files and it's a doozy. Dank Nuggzz is on the Instagram. Go find them. 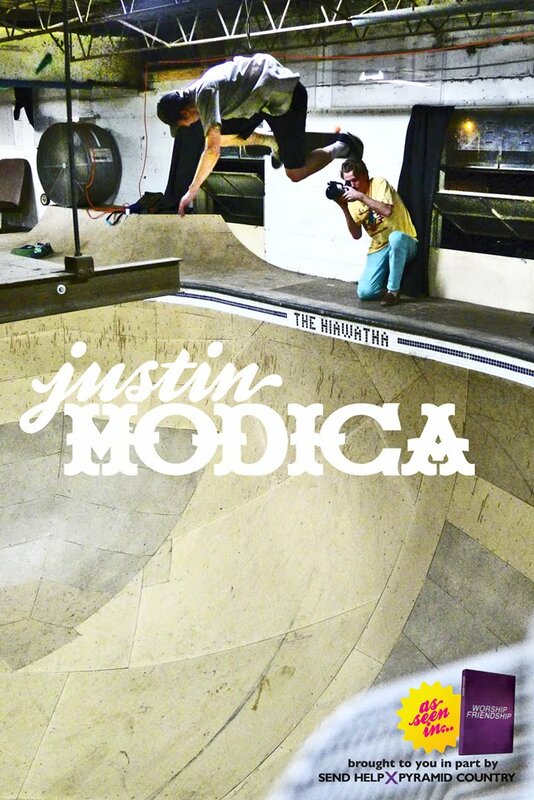 That Justin Modica is so-so refreshing to watch. First time I have ever heard of him! I really do feel like I can feel the ground - the looseness of his trucks, even - just watching him skate certain spots. And the song was great, nice and smooth and graceful.